marta writes: in freezer meal heaven. i love freezer meals. for reals. she, another darling friend ashlynn, and i came together one saturday morning, armed with our aluminum pans, ingredients and recipes to share. we each chose one main meal and tripled the recipes (for our grocery lists) and bought enough for a batch for everyone. i loved the fun of trying new meals; one minestrone soup (mmm..mmm.) and the other veggie calzones (more, please..). both of which i would have never attempted on my own! i went with my sister-in-law's recipe of chicken enchiladas. they are a family favorite and i like playing it safe. i like the challenge to make something extra scrumptious so you can hardly wait to dig into the freezer to see what is waiting! with most of the meals–since we have small families–we got even more dinners out of it (two more calzones are still in my freezer)! for example, you can easily split up a 9x13 recipe into two square pans and get two meals out of it. they also brought along frozen cookie dough logs (ashlynn's uh-mazing cinnamoney oatmeal chocolate chip cookie dough. isn't it bliss tasting new versions of an old favorite?!) and other sweets for freezing (you must try kj's divine coconut joys someday)! kj was a pro at playing hostess for this kitchen-sharing gig. her house was spotless, the kids were off playing with their daddy, her kitchen was clean and accessible with plenty of space for the three of us to do our thing in an efficient manner. she had a basket of fresh hand towels at the ready, plenty of spices, bowls and whisks too. she also had extra disposable pans, foil, markers and saran wrap. it's also a delight to toy around in someone else's kitchen and enjoy their handy gadgets. (she had to teach me how to use her can opener. it opens cans without a sharp edge! love that.) kj had a small table of drinks and appetizers read for us too. i still feel badly about leaving her with a mighty mess, i'll have to host next time to repay her. we did the bulk of the prep at our own stations and then we'd come together to put our own portions togther. it was like a mini hands-on lesson, which will be helpful when i attempt the recipes on my own. we managed to do the extra necessary steps ahead of time, so we weren't all at one stove or all needing to use the oven simultaneously. kj had all her veggies cut up and ready for the soup. i cooked and shredded the chicken and grated the cheese for the enchiladas the night before (okay, actually dan did it, come to think of it) and i softened the cream cheese the morning of. when i got to the party, all i had to do was stir up the mixture and teach how to assemble the enchiladas, hold a darling little baby girl, help stir the soup and learn about calzone making (easier than i'd imagined)! the party was seamless; great company, delicious food, lots of chit chat (i'm totally convinced i need to go on a disney cruise someday...), and the best freezable party favors ever - meals for the whole family! i saved on our grocery bill too, not to mention the happy husband and less-frazzled-wife bit. with so many hands, the process of assembling meals was speedy; we were done by noon and i had plenty of time to shop for stocking stuffers while dan and benji played the day away. Boil chicken breasts with seasonings of your choice (onions, bay leaf, celery salt, etc.). Cool & shred. Mix chicken in a bowl with softened cream cheese and sour cream. You may want to add some chicken broth to moisten your filling. You can get creative and add black beans and/or green chiles to the mixture as well. Fill tortillas with chicken & cheese mixture. Roll and line them up in a greased 9x13 inch pan. 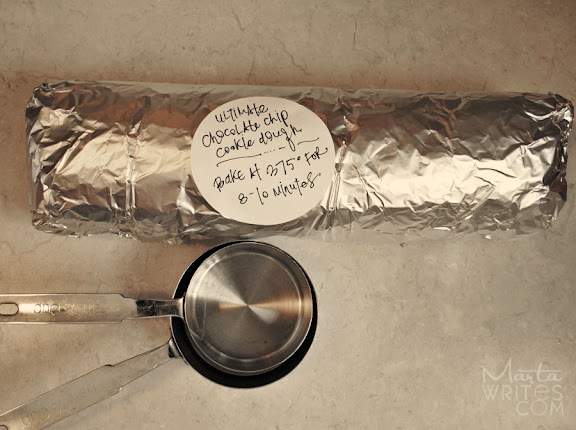 *In a small bowl, stir vinegar into cream and pour over rolled tortillas. Sprinkle grated mozzarella cheese over casserole and cover with tinfoil. Bake at 350 for 30–45 minutes. *If you plan on freezing this pan of enchiladas, skip the vinegar and cream for now and sprinkle the cheese on top of enchiladas directly, cover tightly and freeze. When you're ready to eat them, simply thaw in the fridge, add the cream and vinegar and bake as usual. Enjoy! ever had a meal exchange party? i'd love to hear your ideas. p.s. the cookie dough log pictured is from a recipe on hilary's blog, the ultimate chocolate chip cookie. the recipe calls for all brown sugar (instead of white), which gives these cookies an incredible flavor. What a great idea! So you prepped everything for the dish, and then everyone assembled their own? this sounds great, mart! i love the idea of an excuse to get together with friends... and simultaneously be productive! i have a couple of meals in the freezer right now (half for dinner, half frozen) and it is so nice to know that they are there... for nights i just don't feel like cooking! We actually do this too! We host it in our church's gym every 6-8 weeks because so many people come. It is super fun. We usually come home with 15 or so meals and it is so nice to have so many meals on hand. what a great saturday morning to spend with friends. those cookies sound delicious and i think they will make their way into my kitchen this week. yum. ps. thanks for the blog comment the other day, it made my day to see a blog superstar like you comment. Ok, now I want to host one! Maybe I will get the moms here to do a little group here. Sounds fun! I have never heard of it before but I just might have to set one up with my two sister-in-laws very soon. I love to have rolls of homemade cookie dough in the freezer though but it is a dangerously easy treat sometimes! My brother used to be a freezer king - he and his girlfriend had a freezer stocked with them. I'd occasionally pop over and 'borrow' a few meals. It was ace not knowing what i was going to find in the tupperware. Oh man, I still dream about those enchiladas. Thank you for sharing the wealth... and the recipe!! p.s. so glad you like the cookies! thanks for linking me up! so, so, so cool! the thought of your freezers all packed with ready-to-bake dinners is making ME giddy. thank you for including all the details, and that yummy recipe marta! this same subject came up at our family christmas amongst the sisters-in-law... sounds like we need to join the party. ps. how can you not help but smile at a log of cookie dough? there's just something so fun about it. love it! can't wait to try this and stock our freezer. Thanks for sharing marta! Oh I am very excited about this. I would love to do this before baby comes!! ok, so aren't you jut the nicest? and the enchiladas...oh, yeah. on the soup, next time I'll only thaw it the morning of instead of overnight, and undercook it slightly before freezing. should be better. I LOVE this idea! I'm totally going to have to get together with my girlfriends to do it. We used to do a monthly "supper party" which was similar, but I love the idea of freezing the meals! Thanks for the inspiration! It was great fun! The enchiladas were a hit - I need to make more. Haven't tried the soup yet - more traveling for #5 family death if you can believe it! Let's get together again for February - my house is open. Great ideas, I'll definitely try these recipes! thanks for posting this! about to have a baby and have been thinking of doing freezer meals- never ventured into it before though, so a bit nervous. now i feel a little more brave! 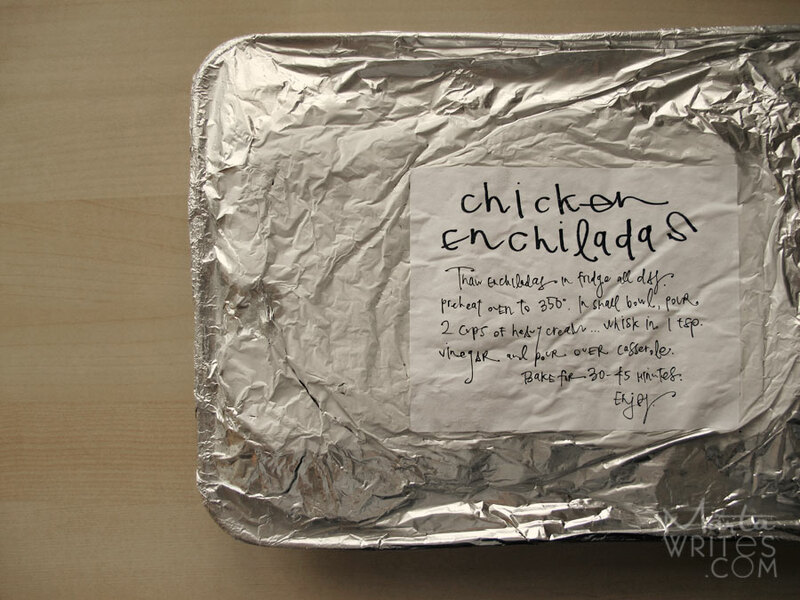 Thank you for sharing the recipe for chicken enchiladas! THIS recipe! Because there are only two of us now, it has been working out better for me to make a large casserole and then after baking, divide it into serving portions and freeze each one separately. At dinner time - a quick pop into the micro and dinner is done! No advance planning or defrosting necessary. 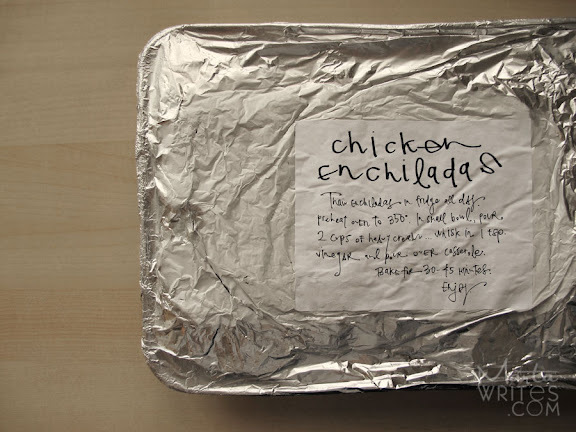 These chicken enchiladas will be in my freezer very soon! Thank you! Can't wait to try out your meals! Thanks for posting. Last winter three of my good friends were all expecting their 3rd babies, and because I think all mommas and babies should be celebrated (and I love a good excuse to have a party), I knew I wanted to throw a party for them. They already had all the clothing/baby accessories that they needed, so I decided to make it a freezer meal baby shower and it was amazing. Everyone who was invited was asked to bring freezer meals to get them stocked up for those weeks after the baby has arrived when there is no time or energy to think about dinner prep. Needless to say it was a hit, and it has become one of my favorite things to do for new mommas! Any of my friends will tell you that I am in love with my small chest freezer, and now that my own 3rd baby is less than a month away I've been spending more time preparing extra portions of our dinners to stash away for us. Every time I put one more meal in there I get all warm and fuzzy inside... I know, I'm a dork. I'm excited to try out the recipe you posted, as well as making some cookie dough too. You need some sweetness at the end to help round out any good meal, right? i am so totally excited to start this. my sister is getting married in july and me and my best friend are both having babies in august so we're all getting together to cook up a storm at least once a month! !